I first heard about the Caine Prize in 2001, when Nigerian journalist Helon Habila won it. It was only in its second year; the debut prize awarded to Sudanese Leila Aboulela in 2000. 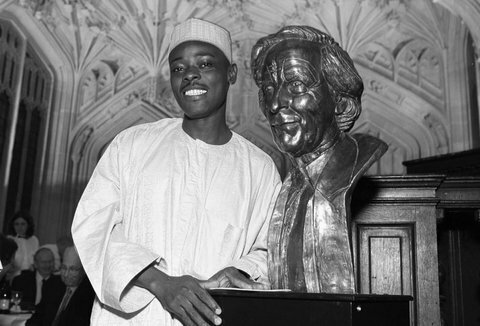 I remember the Lagos Guardian’s coverage of it – as I write this, a black-and-white photo of Habila - posing next to that now-well-known statuette of the late Sir Michael Caine (former Chairman of Booker Plc, and after whom the Prize is named) - hurriedly assembles itself in my mind. “And why not?” Lomba asks. He stands and moves to the window, away from James, so that they stare at each other, the table between them, like antagonists. Following the 1995 extra-judicial execution of writer and activist Ken Saro-Wiwa, Nigeria had earned a suspension from the Commonwealth - only one of the many manifestations of the pariah status that defined Africa's most populous country. Habila’s win was a huge vote of confidence in Nigerian talent. He lived and worked in Lagos as Arts Editor with a daily newspaper, and locally published the collection of stories in which the award-winning story first appeared. He was home-based in a country whose finest literary talent appeared to have fled into exile in Europe and North America. Life changed dramatically for Habila from that moment – a two-book deal followed, as well as a fellowship at the University of East Anglia (UEA). Helon turned out to be the first Caine winner I’d meet in person, at a British Council Festival of African Writing in Kampala in October 2005. Years later he would kindly oblige my request for a reference to accompany my application to study for a Creative Writing Masters at UEA. In the time since, I’ve met several other Caine winners – Uganda's Monica Arac de Nyeko and Zimbabwean Brian Chikwava at a winter arts festival in Belgium, Kenyan Yvonne Adhiambo Owuor at the Storymoja Hay Festival in Nairobi, Nigerian Segun Afolabi at the Caine Prize workshop in Kenya in 2006, Nigerian EC Osondu on Krazitivity, an internet listserve I joined in the mid-2000s, and Zimbabwean NoViolet Bulawayo on Facebook. Yes, Facebook, long before she won the Prize. And then Nigerian Rotimi Babatunde, the newest Laureate (2012), who was in Kampala as well for that 2005 conference. I recall Habila, Babatunde and I staying up and talking late into the night. I had no idea back then that I was with, not one, but two, Caine Laureates – one still seven years away from being recognised. I’ve followed the Caine Prize quite passionately (short of being shortlisted or winning, 'following' is arguably the next best thing), submitted my stories for consideration, and attended a number of events associated with it – the annual writing workshop in March 2006 (I spent my 24th birthday there) and the Prize dinner in 2011, where I earned the (not-dubious) honour of being the first person (even before @caineprize) to tweet the name of the winner, seconds after the announcement. No doubt it is one of the best things to happen to writers of African origin within the last decade-and-half. It has brought several writers to international prominence, and has helped maintain the tradition of short-story writing and publishing on the continent. And you cannot tell the story of the Kenyan litmag Kwani? without mentioning the Caine Prize. Over the next twelve months we will blog once a month – random musings and proclamations about the Caine Prize, discussions of winning stories, comparisons of the Prize to similar prizes across the continent, and random bits of rabble-rousing, if we find myself in the mood for it. We look forward to getting comments and feedback, and hopefully to having some posts inspired by readers’ comments and queries. If you think there’s anything you’d like to see covered, please drop a message in the comments box. "Following the 2005 extra-judicial execution of writer and activist Ken Saro-Wiwa"
Thanks for spotting this obvious error - we have now amended the date! 1. What I have always wanted to know was how these judges go about picking the shortlist and then how do they get the winner. This sounds like a fascinating part of the process we never get to know about. 2. What are your two favourite Caine Prize winning stories? 3. Why don't the Caine Prize guys release the anthology when they announce the shortlist? They would make more sales that way.